October was another strong month for equities, generally speaking, as they continued their run up. Although they continue to keep reaching new tops, it appears that the positive momentum signals may be decelerating slightly. Considering that this year has been characterized by unprecedented low volatility and markets that continue to make higher highs, the currently high momentum can only be sustained if markets proceed with very strong returns month after month – which we know is inherently unsustainable. 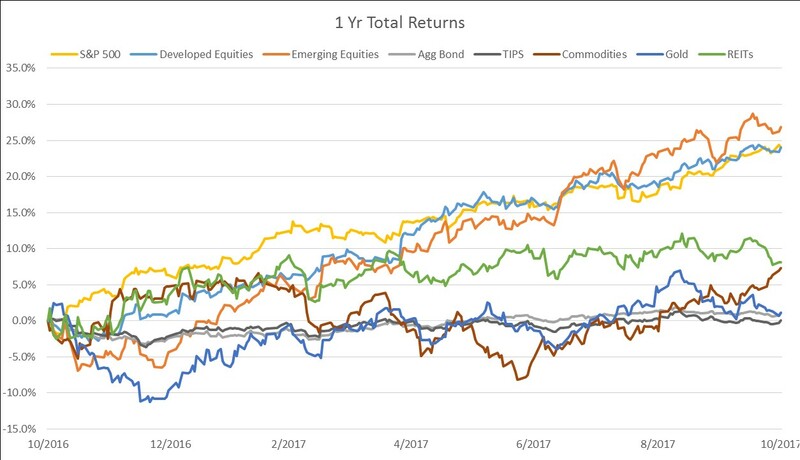 The only asset class that had increasing strength of momentum during October was Commodities, which actually shifted from a previously negative momentum into positive territory due to the solid performance experienced since June of this year. In relative terms, international markets (especially EM) offer better investment opportunities than domestic equities. 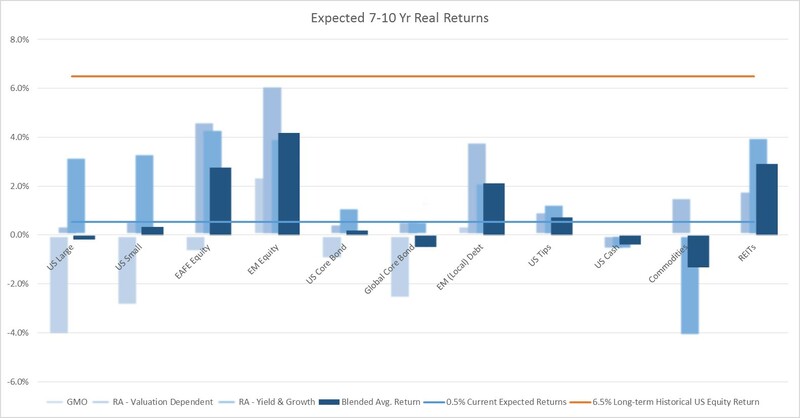 It’s useful to consider how future returns are expected to be muted compared to the long-term returns experienced in each of these asset classes; however, that is mostly useful from a planning perspective to make sure your individual goals can still be accomplished given a lower-return environment. The relative return expectations are much more useful when considering your optimal asset mix within your investment portfolio. For instance, noticing that US equities are significantly overvalued and pose a serious potential risk within your portfolio – expected to barely beat inflation at best, or possibly some significant drawdowns in the near-term at worst – it would probably be prudent to shift a portion of your allocation that would normally be in US equities into other asset classes that may have less risk of poor performance in the coming years. Also, even if you don’t change your target allocation much or at all, it probably makes sense to rebalance your portfolio to target to reduce positions that have experienced outsized growth recently and represent a larger than intended portion of the portfolio’s risk profile. Just remember that following a repeatable process for making allocation decisions is key here, so that you can use the relevant data in meaningful ways to reduce risk in your portfolio over the long-term.